So once I was engaged that was it all I wanted to do was plan, plan, plan and this included dragging my nearest and dearest around every wedding fair that I could find. I had gone to a few for my friends and sister when they were getting married (before becoming engaged) and my thoughts were that they were a bit of fun, I would laugh when people mistook me for the bride using the "ha ha I wish" line a few too many times. When you are not the bride you can wander round without a real care picking out ideas you think the bride may like. Switch to going as a bride and it is a very different story. My fiance proposed in the October and the closest wedding fair was at the end of January and to me that was torture. All I wanted to do was walk in there as the bride and it be all about me, if you speak to my friends they will tell you I usually don't need an excuse to be centre of attention lol :-) but this was my time. And when the wedding fair rolled round me, my mum, Thom my fiance and one of my bridesmaids all went along. At this point we had not booked anything didn't even have a date in mind so I thought this was great as I would get loads of ideas. Walking in straight away we are met with eager stall owners ready to chat and tell you about their amazing business, but unlike before all of their questions were directed at me as I was the bride which meant no one to deflect questions to and oh my there is a lot of questions. The most asked question is "When is your wedding?" which I answered with "I have nothing booked yet!". You can see their faces light up as they dive into their sales pitch and ask you more questions about a wedding you have no idea about yet. So you politely take their info and chat about whether you like that idea or not once you are out of ear shot of the person, but you just have to take one step and the next vendor is on the case with the next round of questions. "Do you have a photographer?" - No - "Great have a look at this"
"Do you have a Venue?" - No - "We do great deals"
"Do you have Chair covers? ", "Do you have a florist? ", "Have you thought about wedding cars?" "What entertainment do you want?" and many more. Like most women (or men) yes of course I already had my imaginary wedding planned out in my head and I had Pintrest boards on weddings long before the engagement however once all these questions start flying your way the magnitude of the situation hits you and how much you have to plan and decide. 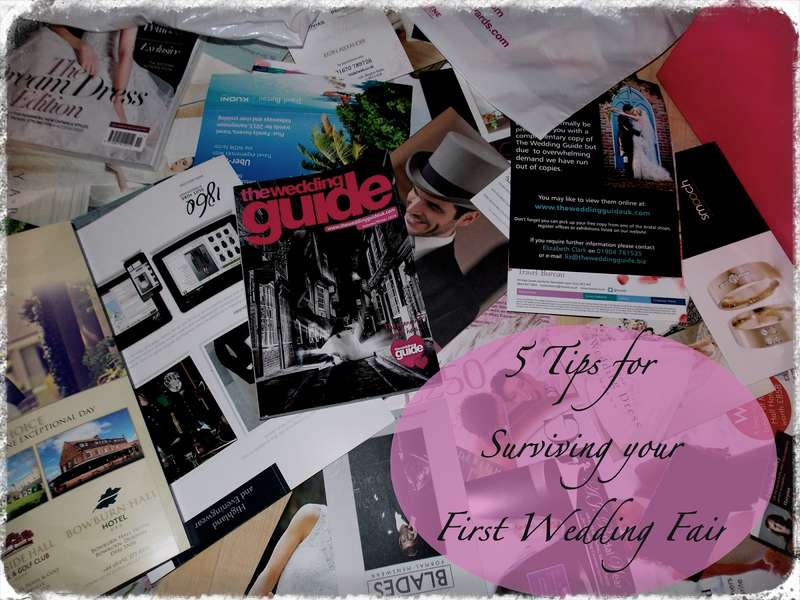 So here are some tips I learned from my first wedding fair that I perfected after a few more. One thing you will find as you start going to wedding fairs is they want your details and they want them bad, be this in the form of prizes or giveaways to getting extra discounts. One of reasons free wedding fairs get you to pre-register is so they can pass your details on to vendors at the show. So after the 20th email in two days I realised I had better set up a wedding email address. It is just a simple one from hotmail with our names in it but it has been a life saver, now I can keep track of wedding related emails and they don't get lost in my usual inbox. I can store all the important emails I get from Vendors that I have already booked. This is really difficult to do as I was so excited to start the planning but if you can hold off at least until you have a venue or a date you will have a few answers to all the questions you will be getting, and at this point be able to get tips on when is best to book each part of the wedding and what should be done first. Representatives from venues do go to wedding fairs so yes you can get ideas before you book somewhere and you may even get a discount. Google and word of mouth are great for booking a venue and nothing beats trips out going to view all the beautiful places that might end up as your wedding venue. This is how we chose our wedding venue, we popped in after passing by chance while driving home from a venue neither of us liked and it won us both over. If there is any aspect of your wedding you know you do not need for example venues, wedding cars or chair cover etc. don't waste your time and theirs by talking to them and taking leaflets, this will give you more time to speak to the different vendors you know you will need. My only exceptions to this tip are cake stands :-). My sister is making our wedding cake so if I lived by this tip I would not speak to them or take information from them however cake stands give you free cake so all rules go out of the window on this one. If you get chatting to a vendor that you like and want to see more of what they do try and get a quote there and then written down or ask if they are doing any wedding fair discounts or deals. You usually will go to wedding fairs with your groom to be or your mum and even bridesmaids but make them aware they are there to carry bags. 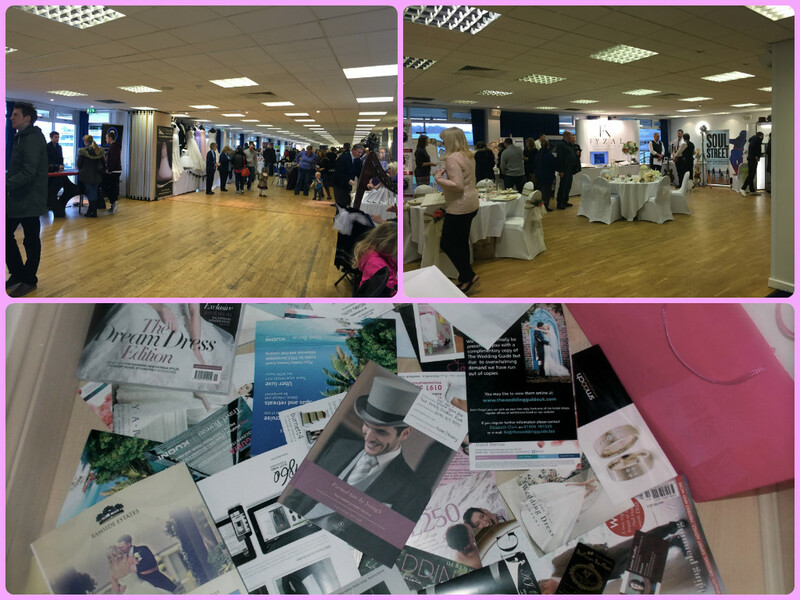 If you haven't booked anything or want as much inspiration as possible when you go to a wedding fair take every bag or leaflet they throw at you (or hand to you politely) and then when you get home you can start to digest all the information and get rid of anything you don't need or don't like the look of. Also this frees your hands up to take photos of anything you want to remember like a table layout, chair covers, wedding dresses and many more. What are your tips for surviving wedding fairs? Disclaimer- I am no expert these are tips that really helped me when attending wedding fairs.